Moto Guzzi has unveiled three special models to celebrate its 80th birthday. First, there’s the Le Mans Tenni which is based on the latest, half-faired Le Mans and named after legendary Guzzi racer of the 1920s and 30s Omobono Tenni. It shares the stock bike’s 1064cc V-twin, but the Tenni is marked out by a green and silver colour scheme that harks back to Moto Guzzi’s V8 racer from 1957. There are also new forks, with titanium nitride coating and the clutch has been modified to give a lighter feel. It is joined by the California EV80, a joint venture between Guzzi and Poltrona Frau – an Italian sofa manufacturer. A full-on tourer, the EV80 comes complete with a huge, bar-mounted fairing and screen and enormous panniers. But the link with Poltrona Frau has lead to the most obvious modification; there’s leather everywhere. The seat and panniers are completely covered, the grips are leather and there are even leather sleeves on the clutch and brake levers. The final anniversary bike is the California Stone Metal, which gains a chrome fuel. 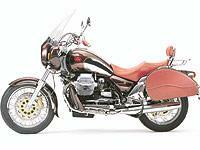 The biggest addition to the rest of the Guzzi range is the V11 Sport Scura. Based on the stock 1064cc V11 Sport, the Scura gets a new, black nose fairing as well as new Ohlins suspension front and rear and lightweight carbon cans. There’s also the new California EV Touring, which gets the same screen and leg guards as the EV80. No prices have been announced. The bikes are expected to be available early next year. See the new bikes from the Milan Show brought together in MCN, published on Wednesday, September 26. Check out other new bikes by selecting LATEST ON NEW BIKES, from the menu on the left.